New technologies have become almost essential in company’s marketing strategies. They give an innovative image to the Company but they are also a way to surprise and entertain the customers. Immersive technologies are following in those steps and are becoming an important asset when it comes to impress an audience. What if everything was based on focus? Marketing uses different strategies to capture the consumer’s attention and thus advertise their products/services. Attentional processes are the basis of data processing. According to the Solhberg and Mateer’s notion (1989), there are 5 types of attention: focused attention, selective attention, alternate attention (to go from one task to another quickly) and divided attention (to do several things at once). In a recent study published in 2000 by Cyberpsychology, Behavior, and Social Networking, a group of researchers used virtual reality to evaluate and apply the 5 types of attention to virtual reality. By offering an entirely adjustable and controllable environment by computer, virtual reality gives numerous solutions to polarize the users’ attentional functions. For instance, when the user puts on the virtual reality headset, he finds himself immersed in a virtual environnement on a visual and hearing level. His main focus will then only be on a task chosen by the company or the institution which created the immersive experience beforehand. By using virtual reality, the focus of the user is only on the product. If another task is asked of him, he will maintain his focus by using sustained attention. Furthermore, by cutting him from the physical world and any interruptions, other forms of attentions, such as selective, alternate and divided attention, are not solicited. Those processes are cognitively expensive and usually found in loud surroundings, like an exhibition room. That is one of the project of the online platform Alibaba. 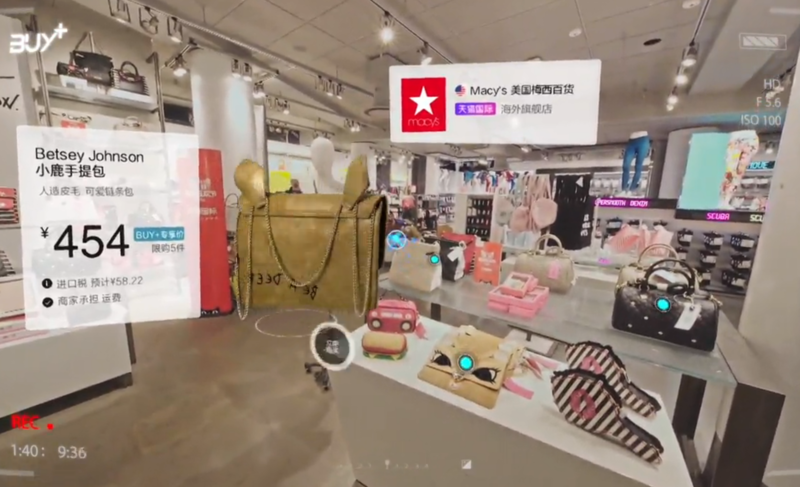 This Chinese company chose augmented reality in order to allow the clients to easily see the products and to access their description rapidly. The project has yet to be deployed but it’s still on a test phase. This technique also works on event strategies. It’s easier to present the products on the stall. Virtual reality can help to present a product by showing all of its features but also by trying it (depends on your scenario). Mikael Södeman, a researcher, worked in this subject in 2005 in a study published on the Journal of Engineering Design. He was then employed at Volvo and he looked at virtual reality as a new communication medium to present car prototypes. His results showed that VR presented an accurate vision of the product in the customer’s mind. In order to carry out his study, 3 tools were at the client’s disposal: a reconstitution of the car in VR, drawings of the car and then the car itself. The analyse of the customers’s behavior, once they’ve used the 3 distinct tools, revealed that virtual reality had close results to the behavior of the customers who had see the real car. Virtual reality presents a product virtually but the comprehension, its exploration and the customers’ behavior toward it, are close to the ones created by a real prototype which is more expensive to manufacture by the company. There are indeed. Apart from the sight and sound, other senses are necessary to prove the value of a product. Other studies show that the weight of a product, its smell or the sensation when touching it, are all taken into account when evaluating the product. As technologies develop, it’s more and more possible to virtually create those conditions, the smell can be incorporated in a virtual reality experience, the touch also. But it exists limits for the consumer which can be broken by different storytelling techniques. The goal is for the users to have a real experience. The main advantage of immersives technologies is the fact that the user is completely immersed in a universe created especially for him. Institutions chose to use it and thus decided to create an environment of their own. Even if it is possible to create a sensation of warmth with simple virtual reality equipment, presenting it in a visual and earring environment which seems warm (a campfire for instance) can create a sensation of warmth for the user. It’s one of the brain’s power. It will always find a way to make sense of everything even if it means creating a perceptive illusion. Immersive technologies can be an important advantage to support marketing strategies. These technologies help maintaining the customer’s focus but are also a way to create a unique environment in which company/institutions can present their values and their universe. Virtual reality, or augmented reality, generates a lot of emotions and bright memories. The use of this technology shows an innovative company which gives a new image of the brand for the consumers. Immersive contents are also a great way to present your product in a playful and less expensive way, especially regarding event strategies. Cho, B. H. et al. 2002. “Attention Enhancement System Using Virtual Reality and EEG Biofeedback.” In Proceedings IEEE Virtual Reality 2002, Orlando, FL, USA ,156–63. Cowan, N. (1998). Attention and Memory: An Integrated Framework. Oxford University Press. Can VR help reduce pain?